25 to 28 July 2016 PROFIBUS Installers are certified, the devices are certified, but what about the system design itself? Join us on this 3½-day course covering the Certified PROFIBUS Installer and optimal design of PROFIBUS automation and control systems. 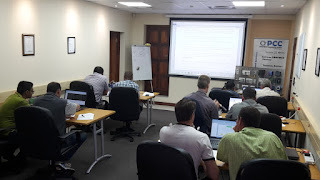 IDX, who operate the PROFIBUS Competence in South Africa, will be hosting the brand new PROFIBUS System Design Course presented by Andy Verwer from Verwer Training and Consultancy Ltd in the UK. It is your chance to be amongst the first in the world to earn this PROFIBUS International accredited certification during his short visit to South Africa. Who is this Course for? The Certified PROFIBUS Installer certification is a prerequisite and will be included in this course and can be considered as a refresher for those who have already obtained the certification. The control system life cycle, consideration of maintenance, health checking and fault finding features. Characteristics of communication and transmission technologies. Environmental considerations and choice of appropriate devices, cables and connectors. PROFIBUS network architectures and their relative advantages in terms of performance, maintenance and reliability. Integrating operation, supervision and engineering information into the control system. How profiles can simplify system design, maintenance and give vendor independence. Use of profile GSD files and DTMs. Essential requirements for hazardous areas and available design options. Design of Intrinsically safe RS485 and MBP segments. Basics of component and system reliability and application of basic reliability modelling techniques. Overview and evaluation of practical solutions for high availability PROFIBUS systems, limitations and essential needs. Basics of fibre optic transmission. Connector and cable types. Design and application of various topologies, solutions for redundant fibre optic systems. Basics and design considerations for infra-red and wireless communication. Essential requirements and design options for safety related systems. Control system sampling and timing considerations. DP and PA cycle time and jitter estimation. The effect of gateways and couplers. Basic characteristics and applications of isochronous cycle timing. The course includes case study material and practical examples on how the techniques are applied. A theory test at the end of the course ensures that the attendees understand and can apply the material covered. Successful candidates will be awarded the Certified PROFIBUS System Designer Certificate issued by PISA. Space is very limited! To book your spot and get a quote, please send an email to academy[at]idx.co.za or call IDX on +27 11 548 9960. Content adapted from www.verwertraining.com. For training outside of Southern Africa, please visit the www.verwertraining.com.